When I was supposed to be sleeping the other day I woke up with a stomach ache (long story), and went downstairs for some soda crackers and 7 Up. (They’re called soda crackers, so you have to drink soda with them. That’s the law.) Naturally I flipped on the TV, only to discover we were thirty second from launching a car into space. By “we” I mean Elon Musk, the rather eccentric rich guy head of SpaceX, who I now love more than ever in a not creepy sort of way. Musk was testing the Falcon Heavy rocket, the biggest space vehicle since the shuttle. He intends to use it to send people to interesting places like the Moon, Mars, and Uranus, which I understand is infested with asteroids. Since this was a test–Musk actually said pre-launch that the chance of failure was high–he decided not to put any important cargo on board. But he needed something to test its payload capacity, some weight … and, looking around, he spotted the vast warehouse that contained his collection of over ten thousand cars. I’m making that part up. All I can say is that if I had several billion dollars, I’d be launching stuff into space, and I’d also have a collection of antique fire trucks in a vast warehouse. Clearly he and I are virtual twins. Anyway, he did happen to have a Tesla roadster sitting around, and also a mannequin dressed in a spacesuit. I’m trying hard not to judge, here. Besides, I’d have a spacesuit, too. So he set the spaceman in the Tesla, a detail I didn’t know about when I turned on the TV and found a giant spaceship on the pad. After launch the two booster rockets, in a display worthy of an Olympic event, landed simultaneously, ready to be reused. The main booster … not so much, but two out of three ain’t bad. Then the spaceship went into orbit around the Earth, and its roof retracted, and … wow. The last official Instagram from “Starman”. How he managed to type in those thick gloves, I don’t know. When Emily came in I got the footage online and played the whole thing over, still grinning ear to ear. It was just so cool. Elon Musk, in addition to understanding that the future of mankind lies in space, also has a great sense of showmanship and humor. When I grow up I want to be just like him, especially the rich part. Musk sent the Tesla into deep space, having said there was a slim chance it might actually hit Mars, although apparently it wasn’t aimed directly at the Red Planet. Instead the rocket overshot its mark, and is now on a long loop that will take it into the Asteroid Belt. I wouldn’t be surprised if Musk did that on purpose, just to show off the capabilities of his rocket. I mean, the thing can haul 64 tons, so what’s a sports car and an astronaut? Talk about an off-road race. I applaud Elon Musk, and not just because I want him to send me seed money to launch my writing career. Space is still hard and dangerous, but it’s also full of possibilities in resources, knowledge, innovation, and just plain being neat. One of the problems with the world today is that so many of us no longer have a sense of wonder, or understand the value of exploration for the sake of discovery. We need to get that back. And with our politicians busy infighting and backstabbing, it may be innovators like Musk who will take us into the next phase of the human adventure. Or at least send me some cash. 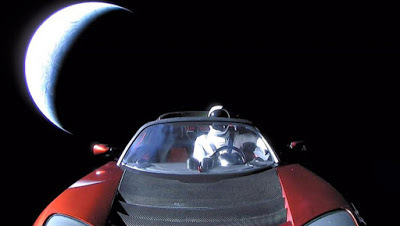 2 Responses to Starman and the Space Roadster, Or: Musk to Mars! That Tesla is getting great mileage. True, but I’d get great mileage too if I mounted my Escape on the back of a flatbed truck! I’m sure I’d achieve … wait for it … Escape velocity.